Stomatitis is a condition that involves moderate to severe oral inflammation. Stomatitis is a painful condition that is frequently unrecognized early in the course of development. Dogs with stomatitis typically eat and play; however, their activity level does not indicate that they are pain free. If the mouth is inflamed, it is likely to be painful. The first logical step is to determine the cause for the inflammatory response. Acute necrotizing ulcerative gingivitis (ANUG) or "trench mouth" is a condition described in humans characterized by severe oral inflammation (stomatitis). People with this condition complain about oral pain. St. Vincent's stomatitis is another painful oral condition characterized as an infection that progresses with increased severity in oral inflammation and ulceration of the oral mucosa (tissues). Lymphocytic plasmacytic stomatitis complex is frequently recognized in cats with chronic stomatitis. These cats are often painful. They may have: excessive salivation, most are not eating well or they may be anorexic. Recurrent, severe periodontal disease may also progress to widespread stomatitis. Chronic ulcerative paradental syndrome ("CUPS") is a common presentation in Maltese and other breeds frequently treated at Animal Dentistry and Oral Surgery Specialists, LLC. Diagnosis of these stomatitis cases is based on the clinical history of progressive oral inflammation, elevations in globulin, and presence of total protein in cytology (fine needle aspirates) and histology. In cases where the oral inflammation is present in all four dental arches, cytology and histology are not needed to establish a working diagnosis. Dogs with access to caustic chemicals, exposure to hot liquids and those that chew various plants or electric cords, may present with oral inflammation and ulceration. 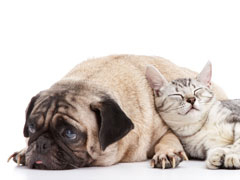 Cats and dogs with chronic renal (kidney) failure may develop oral ulcers due to uremia.